Your guarantee of quick, efficient installation. SMT SERVICES Installation Services is the most cost-effective way of carrying out the physical installation of SMT equipment at your premises. This service is suitable for experienced customers who have the same equipment onsite and who are familiar with our machines and way of working. If customers need more support, we can easily adapt to it. After the installation, a test will be conducted to ensure the equipment has been correctly installed and functions properly. Experienced, qualified SMT SERVICES personnel install and test your equipment. Installation will be scheduled according to your requirements. Fast and effective installation of approximately one to one-and-a-half day max. Post-installation support agreement proposal included. An SMT SERVICES engineer takes care of the complete installation of your P&P equipment. Using experienced personnel minimises the chance of unforeseen problems and delays. 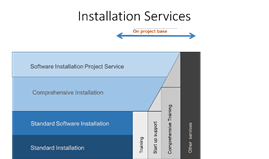 We will prepare the installation by sending you the Installation Plan (project plan). You will be required to conduct a check of your facility and to take care of any preparations required for unloading, transferring and positioning of equipment. Unloading of trucks, unpacking the crates and locating the equipment is conducted by your own staff under supervision of our engineer. You are responsible for connection of the equipment to the necessary infrastructure (power/air supply/networking). Our engineer will do the adjustments and set up of the equipment following connection. A post-installation test is carried out to ensure the equipment functions properly. SMT SERVICES will prove the machine is ready to start production by running it in test mode. In addition, you will receive a service contract proposal from SMT SERVICES. Acceptance of that proposal will ensure you of the highest-level support during the warranty period and post-warranty period. All work is carried out in close cooperation between trained SMT SERVICES personnel and your floor/production manager.